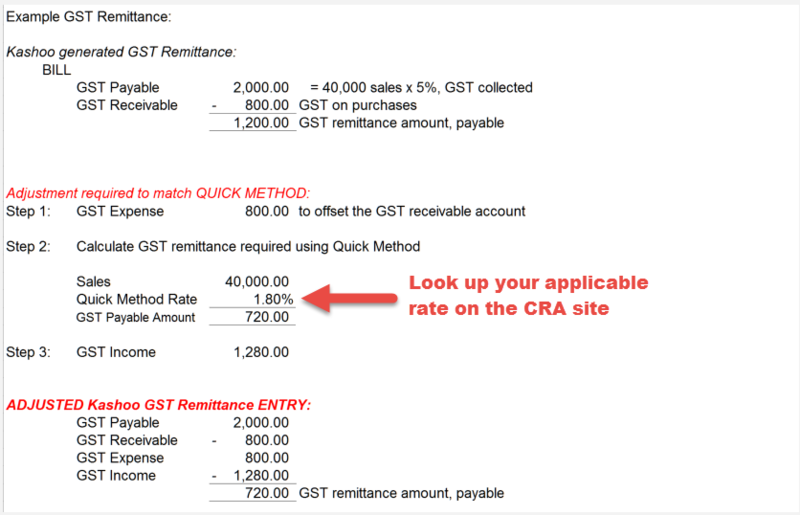 Under the rules for GST/HST, the usual method of calculating the net tax to remit involves calculating the tax you collected and your input tax credits, subtracting one from the other, and remitting the net amount. Some businesses that make less than $400,000 annually in taxable supplies can opt to use the “quick method”. When using this calculation, you only need to know how much tax you collected in the applicable period and apply a percentage to that amount. The resulting calculation is the amount you need to remit. The actual percentage to use varies from province to province but is meant to reflect a reasonable estimate of the result that would be obtained using the regular method. If you choose to use the quick method, you must do so for at least one full year. First - understand that the Quick Method does not require you to track Input tax credits, GST/HST that you have paid on purchases, EXCEPT for major purchases such as significant fixed assets. If you have been tracking all Input Tax Credits you must record a Sales Tax Adjustment to reduce that line (108) on the return to zero (or the amount of ITC on major purchases if applicable). If you are just getting started, or want to change your procedure, use an Exempt tax code on most purchase transactions (except major asset purchases) so that ONLY the ITC on major purchases are tracked. Post the ITC adjustment to a Miscellaneous Expense account. Second - you must record as "Tax Collected or Collectible" an amount that you calculate according to a simple formula prescribed by CRA. Do this calculation manually (calculator, spreadsheet, back of an envelope, whatever) and make a record of your calculation. The difference between the calculated amount and the tax actually collected should be recorded as a Sales Tax Adjustment to increase Line 105 on the return and posted to a Miscellaneous Income account.